When one chooses psychology as a subject for study one must be comfortable talking to new people and forming new acquaintances. Experiencing various situations and being sympathetic to individuals having various problems are vital qualities of a good psychologist. For students looking for lucrative jobs in various fields, having individuals from a particular field talk to them and discuss job markets is great for acquiring perspective and developing an understanding about that particular field of work. 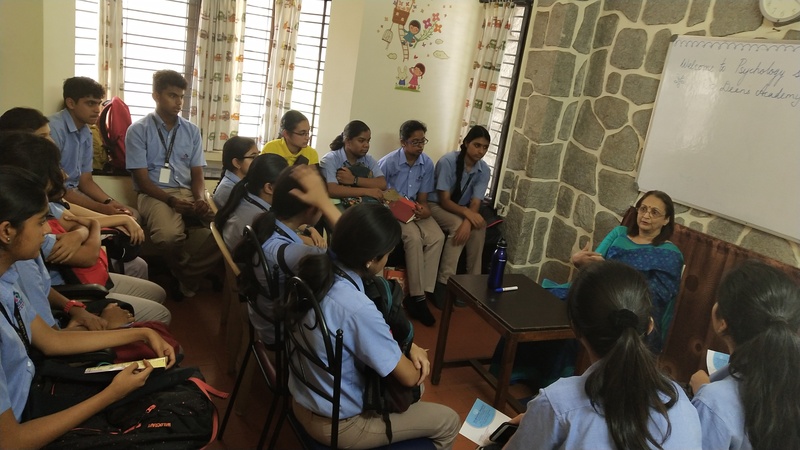 The students of grade 12 of Deens Academy visited Turning Point on 3rd April, 2019 with their psychology teacher Ms. Charlotte Soans. Turning point is an institute that deals with psychological ailments and disorders. The initiated was started by Dr. Sulata Shenoy (PHD. in Psychology) who has around 27 years of experience in the field of Psychology. Dr. Shenoy started off by asking the students what they thought psychology was. She then gave the class a brief summary about the evolution of psychology. Dr. Shenoy emphasised on how preconceived notions can harm the assessment of a psychologist. She warned against making conclusions about clients even before understanding their problems. She said venting out and talking are in themselves therapy. Dr. Shenoy encouraged interaction and was keen on bringing out the students’ opinions on various topics. The class went on to talk about the reasons for which psychology is not as developed in India. The students gave many answers. Some said it was because of the stigma society has towards the topic while others felt religious beliefs was the reason. Some also said that many Indian students choose mainstream careers and don’t opt for subjects like psychology because of the uncertainty involved. She also gave the class anecdotes of her own experiences with handling stigma. The class also spoke about how Indian society views mental strength and how people are conscious about the opinions of society. Dr. Shenoy argued that the Indian society provides a framework in which supporting the old and differently abled is the responsibility of their families. Dr. Shenoy then went on to talk about how psychologists today talk about bringing the body and mind to one place. In the fast-moving world that we live there is great demand for facilities that help in this. Yoga, Tai-chi, meditation and counsellors are paid high salaries in countries like Vietnam, Indonesia and the USA. Dr. Shenoy then spoke about the strength of the mind and how important it is for a psychologist to understand the mind’s capacity and power in an individual’s life. She emphasised on how positive attitudes and a good value system helps with disorders. From all of this the students realised that having family and friends who are understanding, is essential in cases like these. The class moved on to discuss the scope for psychology in India and abroad and various careers that the students could pursue. The students were interested to find more about sports psychology, genetic psychology and research in psychology. The students were then given some refreshments. The students were then taken around the institute where they learnt about play therapy. Play therapy is a good method to bring children to talk. In the case of adults, giving them conversation starters to get them to talk is a great way to acquire information. The students were taken to a class to observe a remedial therapy work with a boy to improve his spellings. Dr. Shenoy believes that remedial therapy works on studying patterns of children and can be used to improve and disability in cognitive functioning. The students clarified their doubts and thanked Dr. Shenoy and her assistants for their valuable time and help. The students then returned to their school having gained knowledge from an experienced professional.